An iron mission church costing £300 was opened in 1884 (CDK 1884 pt 2 p153) in this outlying part of the parish of Withyham. It is recalled by the name of the road that leads to the present church from the main road – Iron Church Lane. Ten years later, funds were sought for a permanent one, designed by L W Ridge (CDG 1894 p15). Despite a grant of £200 from the Bishop of Chichester’s Fund, the foundation stone was not laid until 1901 (ibid 95 p73) and the new church was consecrated the next year (ibid 102 p73). It cost £1308 (ibid), increased from the estimate of £1256 made in 1901 (BN 81 p485). Built of rough finished stone from the vicinity (ibid) the nave and chancel are in the plainest lancet style. Display is limited to both ends; there are five stepped east lancets, contained inside in a large arch. 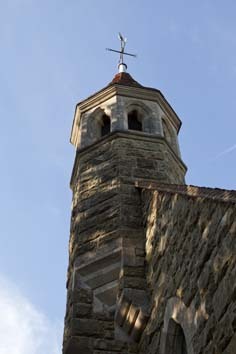 At the west end are two large ones, flanking a buttress supporting an octagonal stone belfry with continuous trefoiled openings, ingeniously corbelled out from the gable. 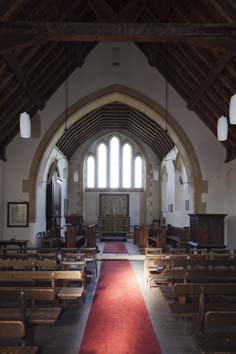 The interior has been redecorated, but has trussed and partly boarded roofs and a broad chancel arch as plain as the rest. 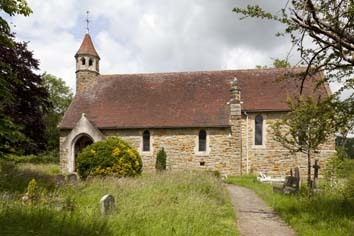 At present (2018) no regular services are held in the church, but it has not been declared redundant. Font: 1902, a copy of that at Ashurst, Kent, close by (CDG 102 p73).